After early move from the UK to the US, Chris grew up in Pennsylvania’s Pocono Mountains before settling in the Pacific Northwest and becoming a guide in 2006, and has been climbing and skiing across the globe ever since. 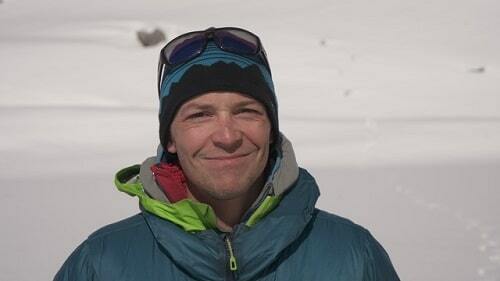 He is a fully certified IFMGA Mountain Guide, and can regularly be found at work from the Alps to the Canadian Rockies and Norway’s Lofoten Islands. His achievements include everything from big walls to virgin summits, first ski descents and traverses, and his guiding career has taken him from the Matterhorn to Denali, and from Pakistan to Mont Blanc. An avid alpinist and expedition climber, Chris has received the prestigious Mugs Stump and Lyman Spitzer Cutting Edge Awards for his ascents of hard new routes on unclimbed peaks in the Karakoram and the Himalayas, as well as the rest of the world, including the famed East Face of Alaska’s Mooses Tooth. He is easily excited by rocks, snow and ice, and by travel, coffee, beer and greasy food of any sort. Both Dylan and Jonathan (also Lee and Eric) immediately make you feel comfortable and you trust them and their decisions right away. Their personalities are unmatchable and it made the trip unforgettable with laughing, nicknames, and games along with the climbing.